A station wagon (American usage), wagon (Australian usage, though station wagon is widely used), estate car (or just estate, British usage) or a break (French usage) is a car body style similar to a sedan, but with an extended rear cargo area. 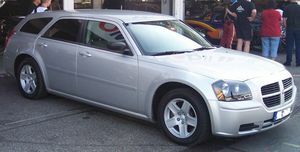 Most station wagons are modified sedan-type car bodies, having the passenger area extended to the rear window (over the normal trunk area of the vehicle). 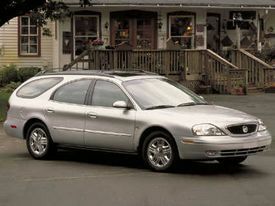 Unlike a hatchback car, which otherwise meets this description, a station wagon is the full height of the passenger cabin all the way to the back; the rear glass is not sloped too far from vertical. Station wagons also have side windows over the cargo area, whereas most hatchbacks have no cargo area windows. 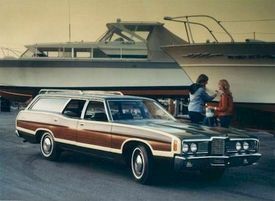 Two exceptions to this rule include Rambler (automobile) station wagons (1952–1962) on which the roof line subtly dipped down over the cargo area, and GM's Oldsmobile Vista Cruiser (1964–1972) and Buick Sportwagon (1964–1970) on which the rear roof section was slightly elevated and combined with four skylights. A station wagon is distinguished from a minivan (MPV) or SUV by still being a car, sharing its forward bodywork with other cars in a manufacturer's range. The popularity of the minivan in the 1980s and early 1990s is credited with the decline of the traditional station wagon. This page was last edited on 19 May 2010, at 08:40.